Everyone is in seventh heaven with the newly born sounds of OU! American producer and multi-instrumentalist Amy Denio has the pleasure of announcing the release of one of the most delightful recordings in the recent history of time. OU is a sextet based in Rome, Italy; the three women are Sardinian, the three men pure Romans, and together they take you on a mediterranean joyride of vivacious original compositions with a folk sensibility, jazz with fiercely funky rhythms, topped with gorgeously lush vocals, sung in Sardinian, Italian, Spanish, Portuguese and English. Composer/trumpetist/ukelelist/vocalist Ersilia Prosperi corralled a group of friends and founded OU in Rome in 2012. Amy was in Rome in June 2013 for her birthday, playing a concert. Ersilia presented Amy a red heart-shaped balloon with a CD dangling on the bottom, that day’s OU rehearsals. Rough but amazing music. Best birthday present ever! Amy agreed to produce the project in Seattle. The other musicians are Sabrina Coda (alto & soprano sax, voice); Martina Fadda (voice); Luca Venitucci (piano, Hammond B3 organ, Fender Rhodes, voice); Claudio Mosconi (electric bass, voice), and Cristian De Fabritiis (drums, vibraphone, glockenspiel, voice). 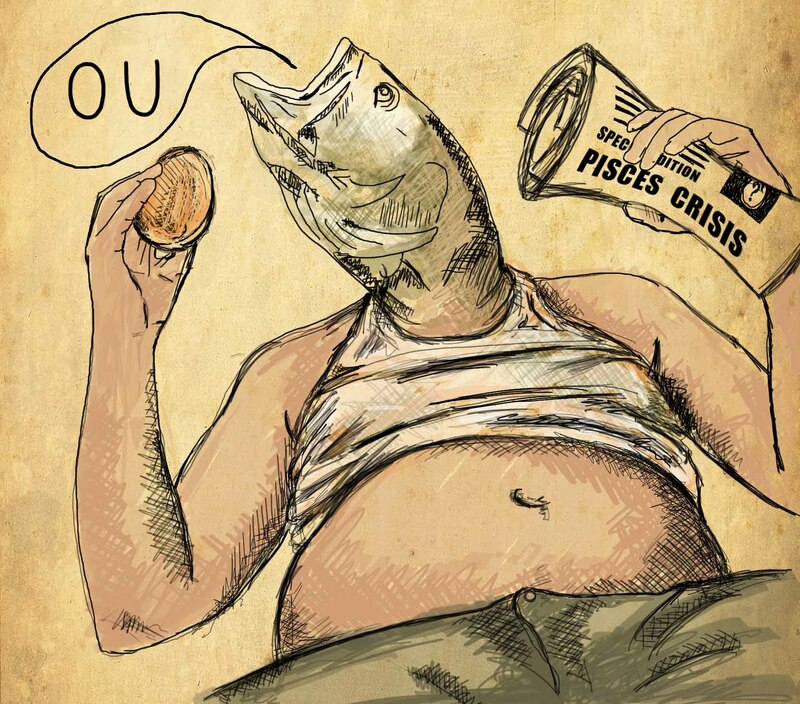 OU ~ Pisces Crisis was recorded and mixed the music in Seattle in October, 2013 at the famed Litho Studios (Pearl Jam’s studio) with Amy’s seasoned engineer pal Floyd Reitsma; Chris Hanszek mastered the project with Amy. Special Offer ~ 2014 is the Chinese year of the Wooden Horse, so the the first 100 copies of CDs ordered from CDBaby include a specially hand-written hOUroscope by Ersilia! Ersilia Prosperi – composer, arranger, trumpetist and vocal for Zazie, Tzacatal, Son de Roma and many others. Records – Aideè Montejo, Zazie, Claudio Meilli, Adriano Lanzi-Omar Sodano, Ned, Ardecore, Nuove Tribù Zulu & Gypsies from Rajastan, Emanuele Martorelli, Razmataz, Roberto Fega, Dispositivoperilanciobliquodiunasferetta, Lame a foglia d’oltremare, Saesciant, Lapingra, Son de Roma, I Rinoceronti, Tzacatal, Alvin Curran and Orchestra Iato, Funkallisto. Tour with Pata Palo, Ardecore, Tzacatal, Zazie, Son De Roma, Titubanda and many others. Luca Venitucci – active from the end of ’80 as musician, singer, improvisator, composer and arranger. Member and co-founder in 1995 of Ossatura, member of different ensemble of Zeitkratzer, with whom recorded and played live with Lou Reed in elaboration of Metal Machine Music, and with Ardecore. His albums are published with ReR, Charisma, Stalplaat, Die Schachtel. Live concerts in numerous international festival, among which FIMAV (Victoriaville, Canada), Kolner Jazz Haus festival (Koln), Musique Action (Vandoeuvre-Les-Nancy), Fundaciò Juan Miro (Barcelona), Total Music Meeting (Berlin). Sabrina Coda – saxophonist, arranger and vocal – Tzacatal, Titubanda, Zazie, Brassmati Aw!rkestra, Son de Roma, Rotobanda, Orchestra Sinfonica de La Sapienza. Tour – Tzacatal, Zazie, Titubanda, Brassmati Aw!rkestra. Records – Inediti, Ned, Brassmati Aw!rkestra, Lame a foglia d’oltremare, Tzacatal. Martina Fadda – awarded scolarship with Elisabetta Antonini, Maria Pia De Vito, workshop with Sheila Jordan, Cameron Brown, David Linx, Diederik Wissel, Dave Liebman. Now plays with Howbeatswhy (synth and voice) and OU. Claudio Mosconi – played and toured with Joe Lally (Fugazi), Fonderia, Pharm, Francesca Reggiani, Massimiliano Bruno, Stefano Scarfone. Recorded with Fonderia “Reenter”, “My grandmother space suite”and Pharm. On tour with Joe Lally (Italian tour in 2007), Fonderia (Between 2004 and 2009 in Belgium, Luxemburg, England), Pharm (Japan tour May 2010), Stefano Scarfone between 2011 to present. Cristiano De Fabritiis – drum and vibraphone – from 1990 play and record with Filippo Gatti, Mike Cooper, Tristan Honsinger, Pharm, Niccolò Fabi, Pino Marino, Alvin Curran, Collettivo ANGELO MAI, Francesco Di Bella, Bloody Riot.